Kazuo Minato, a 59- year-old animal photographer from Nishihara town, found a blue Okinawa Ishikawagaeru (Odorrana ishikawae) which he managed to capture in a close-range photo. It is said that the species is Japan’s most beautiful frog, and the species is registered as the prefecure’s natural monument. The photographer was walking on the forest road to look for animals at midnight on April 10. Minato has been taking photos of insects and animals in the rich nature of Yambaru forest for the past four decades. 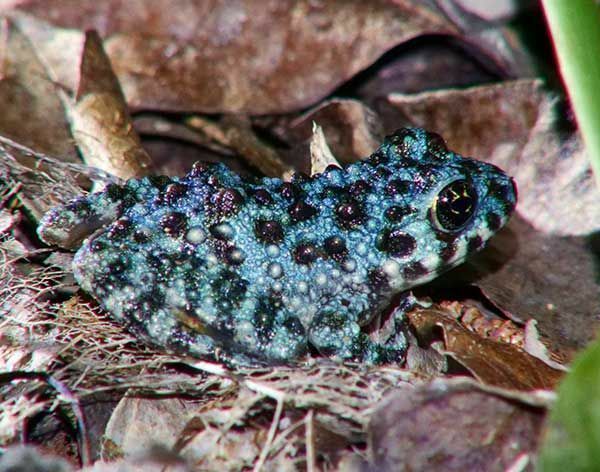 He has watched hundreds of green Okinawa Ishikawagaeru, but it was his first time seeing a blue frog. He later said that he could not find many animals after walking in the forest for three hours since the forest was dry. He found the blue frog just as he had called it quits for the night and started to headed back. The frog was about three to four centimeters and is considered as a young one. Blue frog found in the northern mountains a sign of a happy future?